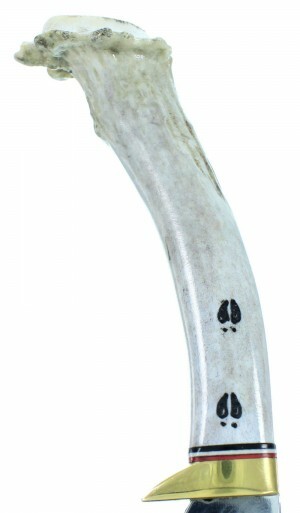 High Carbon Polished Tempered 1085 Spring Steel, Antlers, and Brass. 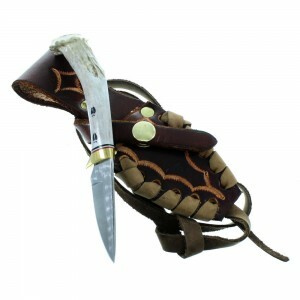 The blade measures approximately 2-1/2” long, and the overall length is approximately 6-1/2”. 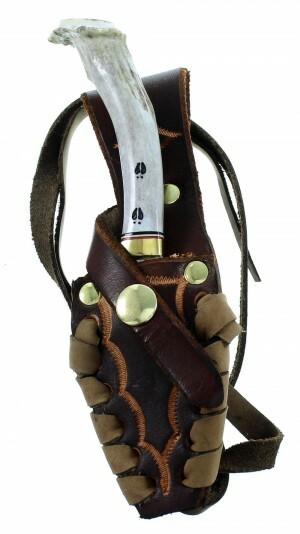 This handy minature knife was hand crafted by renowned artist Ken Richardson and features a plain style blade along with hand carved deer tracks on the stag handle. 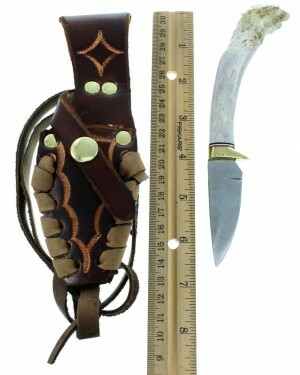 This knife comes with a hand crafted leather scabbard. Deer Tracks are symbols of prosperity, safety, shelter, and also of the proximity to prey. Also used as a directional indicator, and as a clan symbol. Ken Richardson was a professional Ferrier and blacksmith who began making knives out of old cross cut saws in his free time. As demand for his unique knives began to increase his passion for making knives turned from a hobby into a full time job, and he soon set up a small shop in Dillard, MO. After careful research he was able to find a readily available supply of 1085 spring steel that closely matched the metallurgy of the old saws he had originally begun making his knives from. 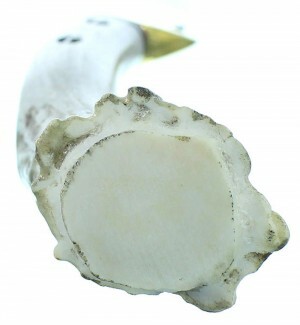 The mountains close to his home provide him with a steady supply of shed Rocky Mountain Elk horn that he uses to make these wonderful hand crafted knives. 1085- High Carbon Polished Tempered Spring Steel, Antlers, and Brass.